Decals Emblems N Hardware : Out-of-Doors Mart!, More Airstream Parts on-line than anyone! This is all the Decals, Emblems and light hardware for Maintenance. 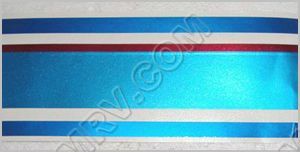 385846-01 Airstream Letter set Blue. This Letter set is used on a 1999 Excella and some other models around that time. See pictures below. 386071 70TH Anniversary Gold Raised letter Logo. The Item was used on the 2001 Anniversary and Classic Excella models. See pictures below. 386070 Gold Airstream Logo. This 32 in Gold Logo was used on 2001 to 2003 Airstream Trailers and Motor Homes. See pictures below for measurements.